Order your Fender Logo 24 Inch Bar Stool from AMS and enjoy Fast & Free Shipping. Get the Best Deal with our Lowest Price Guarantee & Great Customer Service! 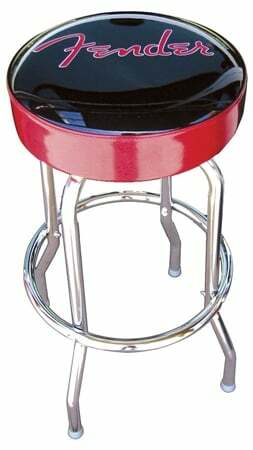 The Fender bar stool was created for music lovers and Fender collectors! This baby will make you feel like you’re in a place where, well, everybody knows your name! The padded 24 inch bar stool is comfortable for playing, or just sitting with some friends. Say cheers to good times, and rock your Fender spirit with a sweet logo bar stool! If awesome were a bar stool and not an adjective...it'd be this sweet seat. Has that classic throwback styling, which I love, it's well made and very comfortable. It's like retro meets metro. I have been wanting one in my home studio and have just kept forgetting. No I have it, it is great for sitting and playing. Easy to assemble, nice height for sitting in front of the amp and jamming. Just what I was looking for !!! Very well made.Looks awesome, great price. Solid seat and easy to assemble. Comfortable for jammin. Great product! Looks AWESOME in music room! What a wonderful addition to my music room. Other sellers have them ... none will match the speed of AMS. I love you AMS!! Bought many items over the years, and, always very satisfied. If you were a woman, I'd ask you to marry me ! Great for the billiards room. This one replaced one I bought 5 years ago that finally broke. Wouldn't recommend as a gig stool, but has a nice vibe for light duty deco.